Cook Concrete Products, Inc. was established in 1955 and continues to be the leading manufacturer of precast products for the civil engineering markets in California, Nevada and Oregon. 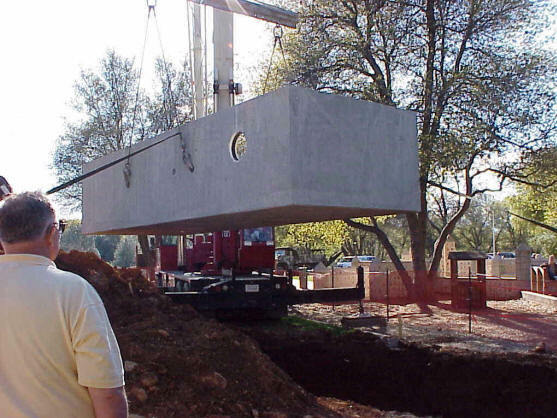 We can design custom precast products to meet your project's specifications. Our product catalogs and CAD drawings are available at your request. Precast Concrete Storm Water Interceptor (4,000 gallon) being set for Fantasy Fountain in Redding, California. Our Mission: To provide the highest quality products with an exceptional level of service that meets both the owner's and our customer's requirements.